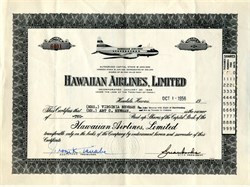 Beautiful uncancelled RARE stock certificate from Hawaiian Airlines, Limited issued in 1956. This historic document has an ornate border around it with a vignette of the company's DC 3 prop aircraft used in the 1950's. This item has been hand signed and is over 59 years old. This is the first time we have seen this early certificate. Hawaiian Airlines, Inc. is the largest airline in Hawaii. It is the 8th largest commercial airline in the US, and is based in Honolulu, Hawaii. The airline operates its main hub at Honolulu International Airport and a secondary hub out of Kahului Airport on the island of Maui. Hawaiian Airlines is owned by Hawaiian Holdings, Inc. Mark Dunkerley is the President and Chief Executive Officer of Hawaiian Holdings. Hawaiian has never had a fatal accident in its entire history, nor has it ever had an accident with a hull loss, and is the oldest US carrier with such a distinction in both fields. Hawaiian Airlines was the number one on-time carrier in the United States from November 2003 until November 2006, when rival Aloha Airlines took the number one spot, pushing Hawaiian to a close second. The airline has also frequently been number one in fewest cancellations, baggage handling, and fewest oversales. Hawaiian Airlines has been rated the best carrier serving Hawaii by Travel + Leisure, Zagat, and Cond� Nast Traveler. Convair 640 turboprop airliner of Hawaiian at Honolulu in 1971. 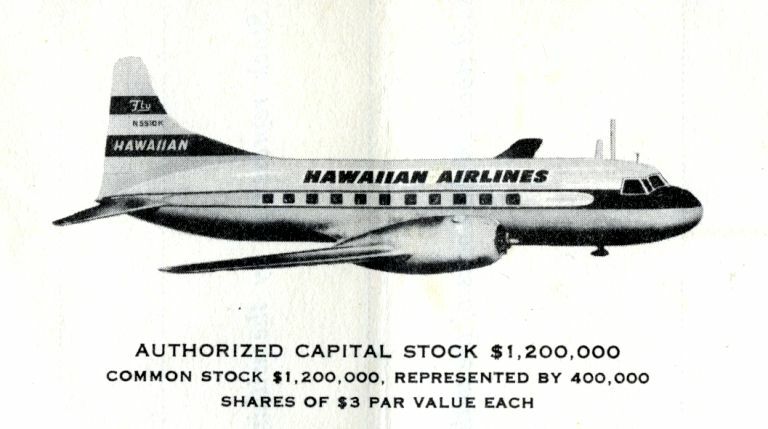 The airline operated Convairs from 1952 until 1974 Inter-Island Airways, the forerunner of the airline which is now known as Hawaiian Airlines, was incorporated on January 30, 1929. Inter-Island Airways, a subsidiary of Inter-Island Steam Navigation Company, began operations on October 6, 1929 with a Bellanca CH-300 Pacemaker, providing short sightseeing flights over Oʽahu. Scheduled service began a month later on November 11 using Sikorsky S-38s with a flight from Honolulu to Hilo, via intermediary stops on Moloka'i and Maui. On October 1, 1941, the name was changed to Hawaiian Airlines when the company phased out the older Sikorsky S-38 and Sikorsky S-43 flying boats. The first Douglas DC-3s were added to the fleet in August 1941, some examples remaining in operation until final disposal in November 1968. In 1966 jet travel started with the acquisition of Douglas DC-9 aircraft, which cut travel times in half on most of the routes. In 1984 the company began to operate charter services to the South Pacific using Douglas DC-8 aircraft, and soon added Lockheed L-1011 aircraft to the fleet for West Coast services. As the west coast market grew, the South Pacific market shrunk, and service was reduced when the company's DC-8s were retired in 1993; and when the L-1011s were replaced by the McDonnell Douglas DC-10 in 1994. According to State of Hawai'i historical records, Hawaiian also constructed the Kapalua Airport in 1987 on the western side of Maui. The airline served this small airfield with de Havilland Dash 7 four engine turboprops. Kapalua Airport was acquired by the state in 1993, and Hawaiian discontinued service to the airport with the retirement of the Dash 7 fleet in 1994. The retirement of the Dash 7 in 1994 also resulted in the airline operating an all-jet fleet. The DC-10s were obtained from American Airlines, who continued to provide maintenance on the aircraft. An agreement with American also included converting to American's SABRE reservation system and participation in American Airlines' AAdvantage frequent flyer program. The DC-10s were retired between 2002 and 2003. The company replaced these leased DC-10s with 14 leased Boeing 767 aircraft during the fleet modernization, and replaced the DC-9s with Boeing 717 aircraft. The Boeing aircraft featured an updated rendition of the company's "Pualani" tail art, which had appeared on its Douglas aircraft since the 1970s. On October 1, 2005 Hawaiian Airlines began nonstop daily flights from Honolulu to San Jose, California. This made San Jose the fifth gateway city in California to be serviced by Hawaiian; the others were Los Angeles, San Diego, Sacramento and San Francisco. On May 4, 2006 Hawaiian Airlines expanded service between the U.S. mainland and Hawai'i in anticipation of the induction of four additional Boeing 767�300 aircraft, primarily focused on expanding non-stop service to Kahului Airport from San Diego, Seattle, and Portland. Additional flights were also added between Honolulu and the cities of Sacramento, Seattle and Los Angeles. In August 2007 the Seattle Seahawks became the second sports team to begin using Hawaiian Airlines to travel to games. The Oakland Raiders, also of the NFL, have been flying Hawaiian Airlines since the 1990s. The two teams fly on Hawaiian's Boeing 767s to and from all their games. Two of Hawaiian's Boeing 767 aircraft have been fitted with decals of logos from the Seahawks and the Raiders. In late 2009 Hawaiian airlines began to install winglets on their existing 767-300s to cut fuel costs. On February 16, 2010, Hawaiian Airlines sought approval from the U.S. Department of Transportation to begin nonstop flights from its hub at Honolulu to Tokyo-Haneda sometime in 2010. The airline was one of 5 US carriers � the others being Delta, Continental, United, and American � seeking approval to serve Haneda as part of the U.S.-Japan OpenSkies agreement. Approval was granted from USDOT to begin nonstop service to Haneda, Japan. The flight began service on November 18, 2010. In addition, the airline is planning to establish a codeshare agreement with All Nippon Airways. On January 12, 2011, Hawaiian Airlines began nonstop service to Seoul-Incheon, South Korea. On July 12, 2011, Hawaiian added Osaka, Japan to its network. On June 4, 2012, Hawaiian expanded to the east coast with daily flights to New York's John F. Kennedy International Airport. On November 17, 2011, Hawaiian ordered five additional Airbus A330-200 aircraft. On August 30, 2012, Hawaiian filed an application with the U.S. Department of Transportation for a nonstop route between Kona and Tokyo-Haneda. This would fill a void that Japan Airlines left when it ceased service to Kona nearly two years ago. However, the US Department of Transportation rejected the airline's application to begin service. On December 3, 2012, the airline unveiled plans to begin flights to Taipei, Taiwan (Republic of China) beginning July 9, 2013 as part of its aggressive expansion plans. On February 11, 2013, the airline started a new venture in the turboprop interisland business, "Ohana by Hawaiian". Service is operated by Empire Airlines using ATR 42 Turboprop airplanes. Service began in Summer 2013 to Moloka'i and Lana'i. On April 10, 2013, the airline announced its first destination in China, with service to Beijing expected to start on April 16, 2014, pending government approval. At the same time, the airline announced that it would end service to Manila in the Philippines on July 31, 2013. On July 11, 2013, the airline signed a codeshare agreement with China Airlines. On March 12, 2014, Hawaiian announced that it would begin daily service between Kahului and Los Angeles on May 2, adding a second flight from June 30 to September 8 in response to passenger demand. It would also begin nonstop summer service between Los Angeles and both Lihue, Kauai and Kona, Hawaii. On August 14, 2014, the airline announced direct service between Kahului and San Francisco beginning in November. On January 5, 2015, Hawaiian refiled its previously rejected application with the U.S. Department of Transportation (DOT) for the Kona-Haneda route with service, if approved, to begin in June. The request was prompted by a DOT decision in December 2014 to review the public interest in Delta Air Lines' Seattle-Tokyo route after Delta reduced the frequency of those flights from daily to seasonal. Hawaiian Holdings, Inc. (NASDAQ: HA) is the parent company of Hawaiian Airlines, Inc.